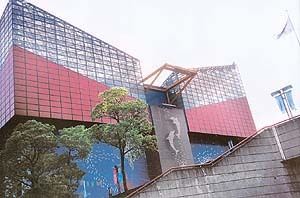 KAIYUKAN, the Osaka Aquarium is situated in Osaka—the world-class convention city and tourist destination in Japan. The Tempozan Harbour Village, home to the Osaka Aquarium, is a thriving high-tech port area. 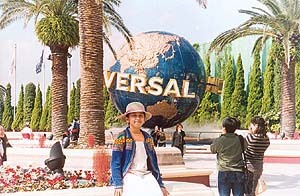 It is about 15 minutes (by subway) from the spectacular "Universal Studios", which has made its debut outside USA, following those in Hollywood and Florida. 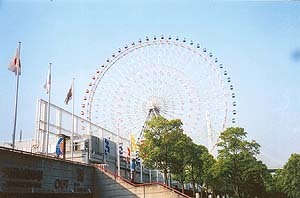 Adjacent to the Osaka Aquarium is the Tempozan Giant Wheel— the largest merry-go-round wheel in the world! From here one can enjoy a panoramic view of the Osaka Bay, the Ikoma mountains to the east, the Akashi Kaikyo bridge to the west, Kansai International Airport to the South and the Mt. Rokko range to the North. Away from the heart of the city, pulsating with an unbeatable nightlife and entertainment choices, here at the port of Osaka one can savour the fresh ocean breeze on a cruise aboard the 'Santa Maria', the replica of the sailing ship that took Columbus to the New World (but only twice the size!). My second visit to Japan in order to participate in a conference in Kyoto, again drew me to the fantastic blue underwater world of the Osaka Aquarium. Opened in July 1990, this state-of-the-art edifice symbolises the Japanese genius and precision. It is made of 103 acrylic glass panes weighing 314 tonnes, which exceeds one and half times the world's annual output of acrylic glass. The largest piece used for the Pacific Ocean section weighs 10 tonnes and measures 5m in height, 6m in width and 30cm in thickness. The "Gaia hypothesis" supposes the earth to be a living organism that came to life through the reaction of volcanic rocks with the ocean waters. Working under the theme of the "Gaia hypothesis", the Osaka Aquarium faithfully recreates the Pacific rim volcanic belt (ring of fire) and the corresponding Pacific rim life belt (ring of life). The ring of fire (in red) indicates the active earthquake and volcanic areas that encircle the Pacific Ocean and the ring of life (in green) indicates the concentration of ocean life. The aquarium takes one on an exploration around the Pacific to experience the grandeur and mystery of the diverse water life and to grasp the significance of our natural environment. The journey through the aquarium begins by entering the 'Aqua Gate' and walking in a huge tunnel-shaped tank. About 11m long, it shows 14 areas with their characteristic marine life: The first area is the Japan inland forests. 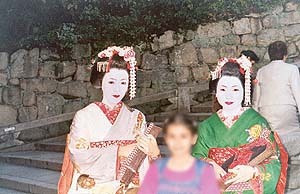 Here one can see the green forests, river fish and shore creatures from Japan's inland areas, where forest rains gather in rivers that flow out to the sea. The Aleutian islands: This tank recreates the harsh rocky environment of the Aleutian islands, where water temperature ranges from 2 to 10`B0 C. Here the playful sea otters are very popular with children. The Monterey Bay area shows a variety of marine animals living along the California coastline. This display offers a rare chance to view the underwater behaviour of sea lions and harbour seals. The Gulf of Panama replicates a tropical rainforest in the dry season, with a forest-dwelling two-toed sloth and tropical reef fish in view. In the Equador rainforest section, deep in the heart of the Amazon, here one finds the world's greatest diversity of plant and animal life. In the Antarctica region, penguins flourish in a frozen habitat of rocks and ice. Visitors can see them swimming gracefully under water as if flying through the air. The Tasman Sea section shows the seas around New Zealand that have large temperature variations. Here we can see dolphins that inhabit warm waters. The Great Barrier Reef is a beautiful reproduction of the world's largest coral reef which extends for 2000 km along the eastern coast of Australia. Here my daughter admired the Butterflyfishes, the Angelfishes and the Damselfishes. The Pacific Ocean area is the largest tank (5400 tonnes) in the aquarium, where we can see "jinbezame" the world's largest whale shark swimming at ease. The spotted Eagle Ray gives it company. Then we come to the Seto Inland Sea- though this area is not very large, featured here are many fish indigenous to this local region. The dense Kelp Forests cover the seabed off the California coast. This area shows a wide variety of fish. The Coast of Chile area-Cold currents flowing from Antarctica upto the coast of Chile are rich in nutrients and plankton on which survive schools of sardines that are abounding here. The Cook Strait exhibit includes sea turtles and fish from Cook Strait ( which separates the northern and southern islands of New Zealand). And last of all we come to the dark depths of the sea, The Japan Deeps!- which display the world's largest crabs which live on trench slopes at a depth of 200-400m below sea level. A knock on the acrylic glass of the chamber sent a chill down my spine to see the huge skeleton-like creatures moving towards us with sharp teeth at the ends of their arms. Walking through these 14 areas seemed like a magical stroll beneath the surface of the waters, to a "replicated live Pacific Ocean". The aquarium unfolds the truth:"The Earth does not belong to man, man belongs to the Earth." And as I sat sipping my coffee in "Mermaid", the coffee lounge of the aquarium, I silently admired the people of Japan, The Japanese genius and hard work, their deep faith in Buddhism ( seen from the beautifully preserved Buddhist Temples dotting the archipelago) and a national consciousness for honesty and cleanliness. It seems the Divine hand is discernible everywhere in this beautiful land!